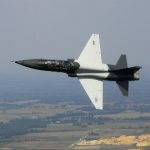 Stavatti Aerospace has announced plans to offer its Javelin military jet trainer and very light fighter aircraft to the U.S. Air Force‘s $16.3 billion T-X trainer program. The company said Friday the Javelin platform, which was derived from the Aviation Technology Group-built Javelin Mk-30 civil jet sportplane, will be offered as a potential replacement for the service branch’s current T-38 training aircraft. A partnership between Boeing (NYSE: BA) and Saab, the Lockheed Martin (NYSE: LMT)-Korean Aerospace Industries alliance and a team comprised of Sierra Nevada Corp. and Turkish Aerospace Industries, also plan to compete in the program. In November, Stavatti received an exclusive license from the present owner of the Javelin project’s intellectual property and physical assets to certify, develop, manufacture, prototype, re-imagine, sell and support the platform as a new Advanced Jet Trainer and VLF. Stavatti said it will also establish a Javelin Industry Team and look to partner with another company in a bid to meet the T-X manufacturing, logistical support and training requirements of the Air Force. Raytheon (NYSE: RTN) and Leonardo ended the firms’ joint pursuit of the T-X contract in January while Northrop Grumman (NYSE: NOC) BAE Systems withdrew from the competition as a team earlier this month.